Extended benefits have been a lifeline for those looking for work during the slow recovery from recession, but Congress is about to let them expire. As many as 3,300 Mainers could lose a key source of income – if not their only source – during the holidays because Congress has not extended a long-term unemployment program. Mainers collecting long-term benefits are among the 1.3 million Americans who will no longer receive checks averaging $270 per week when the Emergency Unemployment Compensation program expires Dec. 28. The state does not track demographic data of people in the program, which was started by President George W. Bush at the onset of the Great Recession, but national statistics show a high percentage of those who are unemployed for longer than 27 weeks are working families or single parents. Additionally, people ages 56 to 65 are disproportionately affected by long-term joblessness. Advocates for the unemployed and conservative policy groups have jointly called for an extension of the program over the past several weeks, saying it is a lifeline for people who lost their jobs during the recession, and that the benefit may allow people to get jobs commensurate with their education and training. Despite agreement at both ends of the ideological spectrum, Congress opted not to extend the program in the bipartisan budget deal that may win final passage as soon as Wednesday. It’s unlikely to pass as a standalone measure before the end of the year. Senate Majority Leader Harry Reid, D-Nev., has indicated that reauthorizing the Emergency Unemployment Compensation program is a priority, but the Republican-controlled House has adjourned for the Christmas holiday so the program is likely to expire Dec. 28. Mitchell Hirsch of the National Employment Law Project in New York City, an advocate for unemployed workers, said Tuesday that it’s “unconscionable” to let the program lapse. According to the Maine Bureau of Unemployment Compensation, 551 people in Cumberland County stand to lose jobless benefits. The bureau says 417 people in York County will go without benefits, as will 309 in Androscoggin County and 377 in Penobscot County. Advocates of the program say it’s an essential tool to offset the effects of the Great Recession, which put millions of Americans out of work and kept many of them there for an extended period. Although the official end of the recession was declared in June 2009, the job recovery has been slow. According to data compiled by the liberal-leaning Urban Institute, more than 4.7 million workers – 39 percent of all unemployed – were actively searching for jobs for 27 weeks or longer through December 2012. A graphic produced by the liberal Center on Budget and Policy Priorities, and promoted by a policy analyst at the conservative American Enterprise Institute, showed that the long-term unemployment rate is above 2.5 percent, nearly twice the rate when Congress ended a similar program after the 1990-91 recession. Extended unemployment benefits are designed to buttress the traditional unemployment program, which is capped at 26 weeks. The extended program enacted by Bush and reauthorized twice by Congress delivers more payments to states with higher rates of unemployment. In states with unemployment rates at or above 9 percent, workers can collect as many as 73 weeks of benefits. States with unemployment rates between 6 percent and 8.9 percent lose access to 10 weeks of benefits, and those with rates below 6 percent lose 14 weeks. 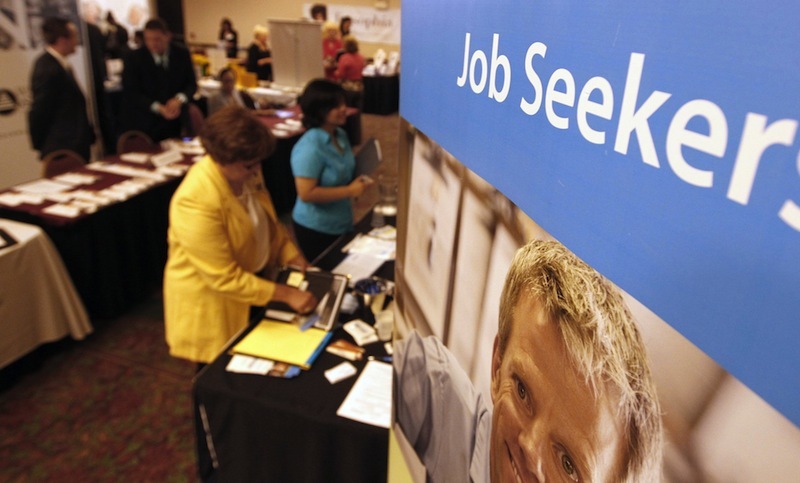 Maine had an unemployment rate of 6.7 percent in October. Julie Rabinowitz, spokeswoman for the Maine Department of Labor, said the department has received many questions about the program from beneficiaries. She said the state has been notifying claimants in messages that accompany the payments, and on the department’s website. Although Rabinowitz said the end of the program will be painful for some Mainers, the LePage administration has been touting the availability of jobs. Labor Commissioner Jeanne Paquette said in November that “there are jobs out there,” noting that the Maine Job Bank had a record high of more than 8,100 open jobs in mid-November. EXTENSION AFTER FIRST OF THE YEAR? Advocates of the emergency compensation program predict dire consequences. “People are going to lose their homes, their cars, the ability to pay their bills, their utilities, their mortgages, even maintain a phone or Internet service,” said Hirsch, with the employment law project. He said Mainers age 56 to 65 could be hit hardest, because employers can find ways to avoid hiring older workers, and have a bias against job applicants who have been unemployed for a long time. Michael Strain, a policy analyst for the American Enterprise Institute, a free-market think tank, told The Washington Post that unemployment benefits increase the rate of unemployment, but only marginally. U.S. Reps. Chellie Pingree and Mike Michaud, both Maine Democrats, support extending the program. Independent Sen. Angus King of Maine, who helped broker the bipartisan budget deal, has said he regrets that the compromise didn’t include the unemployment benefit extension, but he is hopeful that Congress will take retroactive action early next year. Such action would not prevent the stoppage of weekly benefit payments.